Located in a privileged area just 300 mtrs. 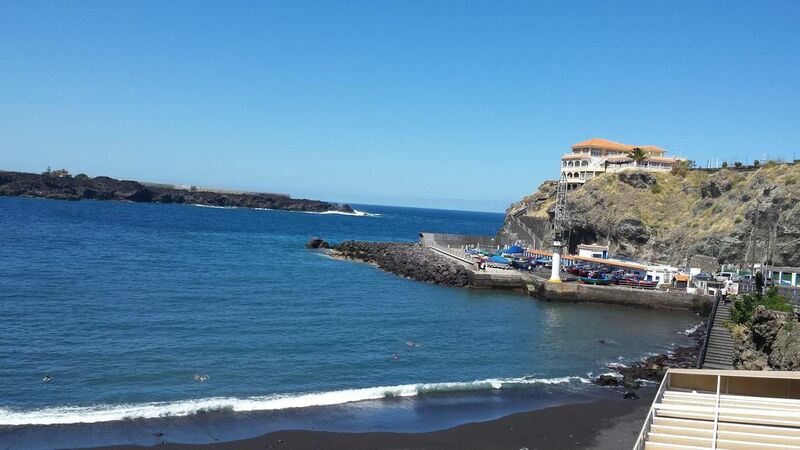 from the black sand beach and fishing port, where you can enjoy fresh fish at the restaurants on the beach. Ideal to rest and relax with wonderful views of the sea and the mountains, surrounded by splendid cliffs. very quiet area away from the hustle and bustle of bars and restaurants. ease of free parking and bus stop at 25 mtrs. Accessible for people with reduced mobility, has access ramp and lift. It is located on the 3rd floor of a new building "year 2004" with a terrace of 65 m2 private of which 30 m2 are solarium and the rest covered, where you can enjoy a dinner in the light of the moon and stars, with an enviable climate. Fully equipped for a perfect vacation. Perfect place to stay for a quiet holiday. Bernardo's apartment was exactly as described on Home Away. It was immaculately clean and very well equipped. The terrace area wa great and we spent many of our evenings sat on the terrace eating dinner and then playing cards until late at night. Bernardo was very welcoming and helpful on our arrival and spent time explaining the area and recommended things to do and places to eat. We wouldn't hesitate to book the apartment again in the future. Wow! Where do I begin?! We travel a lot and almost always rent apartments, and Bernardo is by far the best landlord we've ever had for a vacation rental. He is friendly and welcoming, and he regularly sent us information for events in the area, so we were able to experience several cool things because of him. Also, when we couldn't get the oven to work (the breaker only needed to be flipped), he had someone over within 15 minutes to look at it and help us out. This is my husband's and my 3rd trip to Tenerife in 3 years, and Icod de los Vinos/San Marcos was our absolute favorite location. Unlike Puerto de la Cruz, Icod is quiet and not extremely touristy, but it is close enough to Puerto that when you're ready for some excitement, you can easily find it. The apartment is beautifully decorated, clean, and well-stocked with everything you need. We felt so at home there that I often had to remind myself that it wasn't actually our home. =) I can't say enough nice things about Bernardo, the location, or the apartment. Everything was just perfect! Muchas gracias por haber elegido nuestro apartamento para vuestras vacaciones. Esperamos volver a tenerles entre nosotros para mostrarles nuevos encantos de nuestra isla. Oliver y Sheri han sido unos inquilinos maravillosos. Hasta pronto. Wir (2 Erwachsene) haben uns in dieser Wohnung sehr wohl gefühlt. Alles ist sehr sauber, gut eingerichtet und schön. Die Ausstattung ist gut, alles nötige ist vorhanden. Die große Terrasse mit Essplatz und Liegestühlen ist ein Genuss.Der Vermieter ist ausgesprochen freundlich. Zur Begrüßung standen für uns Getränke, eine gute Flasche Wein und ein Obstkorb bereit. Nochmals vielen Dank ! Ein schöner Weg führt über Treppen am Meer entlang zum kleinen Hafen und zum Strand von San Marcos. Da es eine ruhige Bucht ist, kann man schön im Meer baden. Wir kommen gerne wieder. Black sand beach, a natural cove surrounded by cliffs. From here you can make multiple trips by car or on foot, found on the northwest coast of Tenerife, where you can access the so-called low Island, comprising the municipalities of Garachico, Los Silos and Buenavista del Norte, in all of them you will find many attractions include marina, golf course, natural pools of lava, kilometers of banana trees and vineyards and a splendid coastline. Also it has the possibility of adrentarse in the laurel forests existing in the municipalities of Los Silos, El Tanque, Buenavista and of course Icod. In our town you can enjoy Drago Park, Butterfly, and a historical center very carefully.